Around this time of year, most children start suffering from cabin fever. It’s too cold, too snowy, too rainy, too muddy, or just too much to go outside to play. How can you give your child with sensory issues the physical and sensory input he NEEDS when you’re cooped up in the house? Bring the playground indoors. These ideas are perfect for right now, and can also be incorporated into your child’s everyday sensory diet. Set up an indoor sensory bin. If your child self soothes playing in the sandbox, it’s easy to replicate one at home without making a sandy mess. Get a big plastic bin with a cover. It should hold at least 20 gallons. Get the largest size your child can reach into from a sitting position without pulling it over. Then fill it about halfway with inexpensive dry rice and beans. Add some plastic cups, spoons, and small plastic toys. Have your child pour rice and beans from cup to cup, use spoons to fill cups, bury and find “treasures,” sort out and count beans, and do other interesting things. Best of all, a sensory bin is a fun way to desensitize hands (and feet if they stand in it barefoot!). Some kids love to roll around in a big bin in their undies. This is also a great way to prepare for time at the beach or lake. 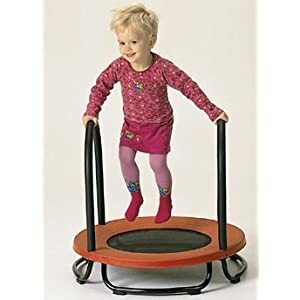 If you have the room, get a mini-trampoline so your child can get the bouncing and pounding movement she craves. You can also opt for a Bounce Pad from Southpaw Enterprises.If you’re cramped for space, or just don’t want to add a trampoline or bouncer into your home, create a launch pad. Pull the cushions off the sofa or set up a big pile of pillows or bean bag chairs and have your child crash into them. If you have room, set up an old mattress on the floor for kids to jump on. Use a sewing machine and make a big bag out of sheets, fill it up with big foam blocks, and sew it closed. Move any furniture or breakables out of the way, making sure everything is soft and cushioned. If your child is very young, or you have safety concerns, have him wear a bicycle helmet. Got nowhere to climb? Staircases can be fun too if your child is able to use them safely. Some kids get the pounding movement they need by simply walking a few flights of stairs in an apartment building, or up and down house stairs several times. Add interest by having them count the steps. Or teach them to have a Slinky toy “walk” down the stairs, and they can retrieve it, take it back to the top, and do it again. Children can jump off the bottom step or even the second step for extra pounding. Again, you must decide if this is a safe activity for your child. Consider an indoor swing. If you have the room and the budget, there are great indoor swing set ups in therapy catalogs such as Southpaw Enterprises. You and another adult can create an instant hammock swing by having the child get into a blanket as the adults hold each end, lift, and gently rock her. Get a Sit ‘n Spin or Dizzy Disc Jr. spinning toy to help your child get vestibular movement. Put on some high energy music and dance with your child.